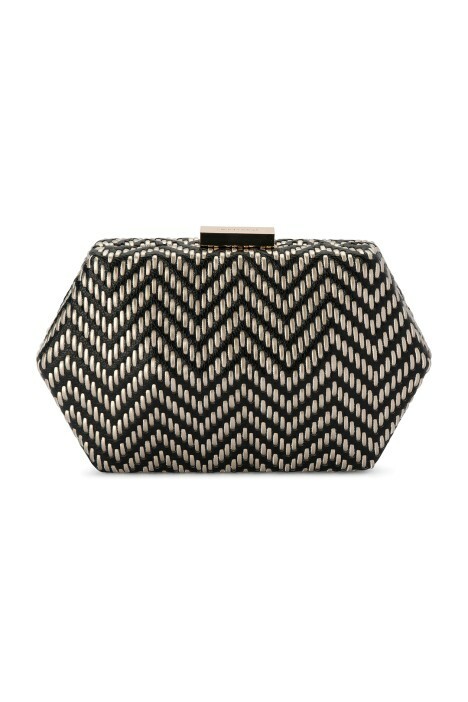 This gorgeous clutch features a stunning chevron pattern all over. Hypnotising to the eye, woven faux leather in contrasting metallic gold creates a mesmerising texture. A piece that’ll toughen up your look - pair with a Camilla playsuit to channel your inner warrior or a gold sequin gown for evening perfection. It closes with a gold Olga Berg clasp and comes with an optional shoulder chain. Read our style guide for more tips to accessorising this autumn. Dawn Zig Zag Pod - Gold is rated 5.0 out of 5 by 1. Rated 5 out of 5 by Rach85 from Perfect! Beautiful clutch!! Even arrived brand new with the tags attached!